During his Middelburg period Kielstra, who had already given the impulse to the publication of the Dutch Mennonite weekly De Zondagsbode, in 1894 (after failing in 1890) successfully insisted on the formation of a committee to care for those Mennonites who were living in towns where there was no Mennonite congregation (Commissie tot de Doopsgezinden in de Verstrooiing). He himself took an active part in the work of the committee and even after he had resigned continued to visit the Mennonites in the diaspora. In 1901 (farewell sermon on 17 February) he left the congregation of Middelburg, and at the same time the ministry, to be a district public school inspector (until 1927). In the meantime he was also a teacher of Hebrew, having already taught Hebrew in the Gymnasium of Middelburg, and continued to teach in Amersfoort until 1930. He did not return to the ministry. In 1910 he seriously considered accepting a call to the congregation of Hallum, Friesland, but finally rejected it. Nevertheless his love for the church was unfailing; he was a beloved guest-preacher in many congregations. In Zeist, where he lived after 1916, there was no Mennonite congregation, but Kielstra, with the help of some others, succeeded in founding one in 1921, and the new church of Zeist was dedicated in 1933 by Kielstra, who was then 81 years old. Besides his Het godsdienstig leven of 1883, Kielstra also published some booklets on Mennonite history; e.g., Hans Denck (No. 3 of the set of booklets for the Mennonites in the diaspora), Het oproer te Munster and Over oud Evangelische gemeenten. He also published some sermons, among them De vreugde van den godsdienstigen mensch (Zwartsluis, 1880), a dedication sermon of the Meppel church, and a larger number of articles in the Zondagsbode. A commemorative sermon preached in 1926 to celebrate his fiftieth year in the ministry was published under the title Na Vijftig Jaar, 1876-1926. Kielstra, being a highly gifted teacher, perhaps more than preacher, had a keen interest in the social problems of his time. With his warm heart he did much for the welfare of the common people, not only during his pastorate, but also in later years; he also wrote a number of papers to insist on better living conditions and pensioning of the working classes. But Kielstra in the first place was a pious man; he was a moderate liberal, but he was not a rationalist like many of his contemporaries, considering the assurance of a heart enlightened by the Holy Spirit of greater value than the acquisition of intellectual knowledge. His whole life was a plea for ethical holiness. In 1890, when a meeting was held to discuss the question whether Mennonites should go into the army if compulsory military service should be introduced (this indeed happened in the Netherlands in 1898), Kielstra declared that the New Testament is a strong testimony against force and that he was not willing to act contrary to the clear statements of the New Testament, for "conscience must not yield to any claim of society." Kielstra was married twice: in 1876 to H. C. W. A. Eger (1853-1892), who bore eight children, and in 1894 to Maria P. Fak Brouwer (1877-1934). His oldest son was Johannes Coenraad Kielstra (1878-1951), who studied law, then became a government official in the Dutch East Indies, and successively rose to high military ranks. He was later a professor at the universities of Utrecht and Wageningen in the Netherlands, teaching agrarian law. From 1933-1942 he was governor of the Dutch territory of Surinam and afterwards ambassador of the Netherlands to Mexico. Like his father he was a loyal member of the church. On the matter of military service, however, he largely differed with his father. In a booklet, Geweld en Rechtshandhaving (Assen, n.d.), he controverted the views of unilateral disarmament and refusal of military service. One of the daughters of Tjepke Kielstra, Henriette Charlotte Kielstra, born 1882 at Zwartsluis, performed no mean achievements in behalf of the schooling of the deaf. She also inherited her father's love for the Mennonite Church, being for more than 25 years, until 1954, a deaconess and a member of the church board of the congregation of Rotterdam. Doopsgezind Jaarboekje (1937): 25-33 with portrait. De Zondagsbode (9 February 1936). Doopsgezinde Bijdragen. (1882): 3, 5; (1883): 43-66; (1891): 101; (1894): 75; (1895): 144; (1901): 214; (1905): 193; (1910): 231. Hege, Christian and Christian Neff. Mennonitisches Lexikon, 4 vols. Frankfurt & Weierhof: Hege; Karlsruhe: Schneider, 1913-1967: v. II, 486. Zijpp, Nanne van der. 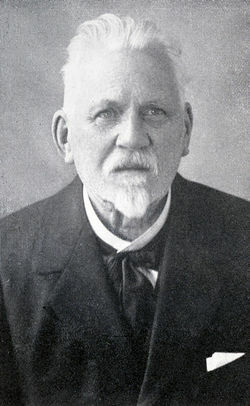 "Kielstra, Tjepke (1852-1936)." Global Anabaptist Mennonite Encyclopedia Online. 1957. Web. 24 Apr 2019. http://gameo.org/index.php?title=Kielstra,_Tjepke_(1852-1936)&oldid=145565. Zijpp, Nanne van der. (1957). Kielstra, Tjepke (1852-1936). Global Anabaptist Mennonite Encyclopedia Online. Retrieved 24 April 2019, from http://gameo.org/index.php?title=Kielstra,_Tjepke_(1852-1936)&oldid=145565. Adapted by permission of Herald Press, Harrisonburg, Virginia, from Mennonite Encyclopedia, Vol. 3, p. 174. All rights reserved.